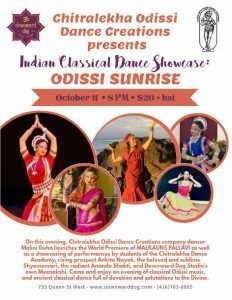 News – Chitralekha Odissi Dance Creation Inc. Owner of the Downward Dog studio in Toronto and the newest member to the Chitralekha Dance Academy family, Meenakshi Joy has invited the Chitralekha Odissi Dance Creations to give a presentation on Thursday, October 11th at 8pm. Students of the Chitralekha Dance Academy Meenakshi, Anandashakti, Shyamesvari, and Ankita showcase their solo debuts on this evening. We are very excited to announce the World Premiere of MALKAUNS PALLAVI. This item was commissioned by CDA graduate and CODC company dancer Malini Guha to have her teacher, Guru Sri Devraj Patnaik compose the music and choreograph the dance as a solo just for her. We will be seeing Malini showcase the World Premiere of her very own Pallavi on this evening.